· What to make next? · Pablo Picasso is where it's at. · Where have you been all my life, hon? I don't have much time to make jewelry any more...though it can be more interesting that way. It becomes less a matter of mass production, and more...hm? It doesn't bother me now to spend a few days on a single pair of earrings. I'm not making them to sell, so it's not a matter of recovering my labor cost. It's more the thought: I want to make something useful, something special. I started doing this September 2005...it took me easily three years to feel comfortable with the mechanics. By "mechanics" I mean basic techniques like wire wrapping and creating components with wire. You don't want to be competent; you want to be sublime. Pearl knotting was relatively easy--you just need to pay attention to what you're doing. Don't try doing it while watching tv...just because the knot feels right, doesn't mean it is right. The knotting tweezers I got from Bead Castle in Berkeley made the process easy. I go there--the owner can tell by looking at a pearl strand what thickness of silk to use. From there, you just need to choose bead tips or french wire. I'd like to do more knotting in fact; there's more to it than keeping beads from rubbing together, or from scattering should the necklace break. It's also a brilliant way to cut the weight of a necklace, and to stretch out your beads. If I invest more time in what I do now, I produce far less waste. It can be as simple as making smaller headpins...I make them as tiny as possible now...using less wire in a wrap, screwing up less frequently, using base wire to model a piece...choosing smaller gauges of wire in the first place, and being more versatile with the gauges/tempers of wire you have on hand. I have a place now with just pieces of wire on it, all mixed together. If I'm making something, odds are good I already have a piece of wire there and won't have to cut more off the reel. I'm still not at the level I'd like to be, by any means; that would involve more capital and time than I have now. That doesn't bother me. I had to wait ten years to become a "real" programmer, but I never thought it wouldn't happen. Ah! It felt good photographing the stuff. It was a rush job with an old camera, at the end of the day, but who cares. I'll try retaking the last picture, because it's beyond pathetic, but doubt I'll have time to do anything fancier. I'd really just like to photograph where I am at this point--it's kind of fun, actually, to go back and see how bad you were before. I do that sometimes with this blog. :) Okay, I suppose it's more a comparison--you go back and see what you were trying to make before, and couldn't. In that sense though, testing is as important as development. It's less spectacular, but testing is what determines whether something will last. Here is a tutorial I stumbled upon: ES Designs >> how to make sterling silver hand-forged hoop earrings - tutorial. What intrigued me were not the earrings, but, rather, the methodology. That's how I want to make jewelry. Not in the manner of, bang together this and that. Beyond the appalling photography, there is everything wrong with these earrings. I don't wear large hoop earrings. They're made of regular sterling silver wire; I've long switched to argentium. I didn't know how to close them, so I made up the idea of wrapping the wire onto the top bit of the hoop. Even the top loops are badly formed. I've since reversed them (yes, I made them identical rather than symmetrical). I don't use that type of stone anymore: low grade blue apatite tumbled nuggets (though the stones are much prettier in real life than in the pic). But once, on casual Friday, I saw them in the box and decided to show them some love. I put them together with a very casual outfit, and got compliments on them, which rather shocked me. Eventually I got the thing to work. And so, more than a year later, I had these rather crude-looking earrings on, and they looked--not like something I would wear every day--but quite pretty, nevertheless. These are pretty much all wrong too. The obvious factor is a waste of Madeira citrine, a beautiful stone. Each stone has a red glow, like a glass of red wine, inside its clear golden brown. Here, the stones are all heaped together. You get a glimpse of color, but can't really distinguish it. It didn't come out well, but imagine five to six times as many birds, all with red and orange chests, on naked grey trees. So that's the theme and I'm sticking with it! I'll want something better-made though, more delicate-looking. What's been frustrating is a sheer lack of time and energy. Yet I try to see it positively too. Sometimes you get stuck in a rut, where you feel you need to keep going, you pour a lot of work into it. If you take a break from the rut, you can step back and plan better, and work more slowly, but produce much better work. Perhaps some of what you did before was a draft. Then other pieces will be too sentimental to you to rework. You shouldn't redo them all. Always keep a piece as is, as a snapshot of where you were when you made it. (However bitterly ashamed you may be of the crudeness of the early work.) Some day you may like to take it out again, and wear it. The best piece I've made since...ah...fiddling around crimping a horizontal bar inside a hoop...is a pair of earrings made of (argentium) sterling chains, small aquamarine faceted drops, and small green amethyst faceted pears. These use a graduated style, smallest chain on the outside, longest chain on the inside...each chain terminating in an alternating stone. On the very inside I put a chain without a stone. That's really the thing...the stoneless silver chain moves more freely than the "stoned" chains, but it's also the longest, so the entire earring is a sort of study of movement. The inspiration here was replicating falling rain. 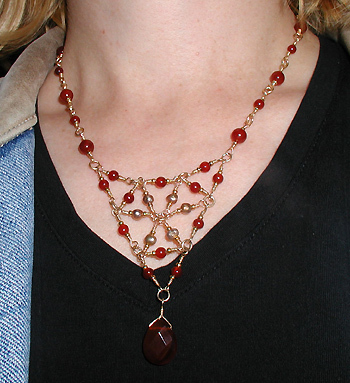 I did a filigree necklace, but the design wasn't original, it was based on something I saw on Etsy. I haven't soldered anything yet...the filigree pieces are held together with fine gauge wire. Humm, what else...I did some goldfilled wire hoops with a horizontal bar across each. To keep the bars steady, I covered the hoop above the bar with fine gauge wire. On the bars, I have a line of graduated wire "fringe"--you make a loop on one end of the wire, hammer out the other end, then file the end smooth and round. I was trying out designs to make in karat gold wire rather than goldfilled. I think this design would be nice that way, but it was way too complicated...mmm...I'd have to come up with a real template before venturing to make it with the spendy stuff. Perhaps I'll make a silver version first and get the exact measurements. I made a few quick 'n' dirty earrings, on a whim...just select some matching stones and connect them. I did a carnelian pair and a nephrite jade pair. I still have more agate stones to do but haven't done them yet. I made a four-strand turquoise necklace I'm not sure of yet. It looks nice actually, but I just made it, so will have to wear it more to see if it needs anything. Ah...I did some post-back earrings, mainly to see how easy or difficult it would be to make them. The design uses a wire spiral to cover the earlobe, and I hung a wire hoop off of that. This is another "dunno yet" design. I have a necklace of tourmaline faceted hearts my daughter designed...and a pair of earrings using tourmalines from the same strand, hung on oxidized textured sterling chains. There may be more but nothing comes to mind...lol...I did make a simple pendant from a chrysoprase bead carved into a lotus shape, but I'm not happy with it. It's way too simple; I'd like to make a necklace from that bead, hmmm...I have lots of other green stones, so maybe I'll do something with it this weekend. Blogged some here: Fashion Notes: Trekking through Etsy. No original work, just some pics from various Etsy merchants. I did go ahead and make spiral earrings. It's experimental...in a way, I don't care whether it's a commercially viable design, since I'm not selling it. I just want to know how it feels to wear them. The ones I made feel different on, having a long "stem" to balance off the spiral. Pretty neat really. I have a small moonstone rondelle hanging from mine. My daughter did the wrap on one of the moonstones. Today I was fiddling around with my new work wardrobe, seeing if I had enough earrings to match my work clothes. Discovered I have an enormous amount of earrings. Well to me it's enormous. I've never owned so many earrings before, even though of course I don't mass produce them. It's just that, over the past several years, I've been making earrings, and now happen to own an almost embarrassing number of them. Been wearing my London Blue topaz necklace a lot lately. It's an appallingly simple design, but the stones are nice...they look flat in pictures, but in real life, the deep blue just jumps out. I think because it's not just blue...there's grey in there, green, brown almost...I've decided it's one of my favorite stones. I'm a bit aggravated...I ordered some aquamarine, so I could make a specific project. I've finally found a good source of aquamarine, I no longer buy it at bead stores nor even at bead shows, where it tends to be dyed. And they sent me the wrong size aquamarine. They've been good overall, but it's still a hassle because I have to send the strand back. I'm hoping to do that tomorrow. These use several ideas...Dain's concepts of color combinations, and Eni Oken's herringbone weave, which I've been wanting to try for a long time. Thanks to Eni's tutorial, I found the weave relatively painless and managed to mangle only the first pass, when I tried using a too-thick gauge of wire for it. I looked around for stones to try the weave out with...I have some large-ish stones along the lines of rough citrine, aquamarine, rose quartz...and two oval prehnites. One of the ideas Dain liked was citrine paired with labradorite, which I'm not sure I'd have come up with in a bazillion years, but it looks beautiful together...very...industrial. :D It's the grey color of the labradorite that does it, that unexpected almost brownish grey, spiked with a little green flash to add interest. I tried several stones out with the citrine; I didn't go straight for the labradorite. I tried tiny peridot, garnets, gold beads, iolite, aquamarine, even the Madeira citrine of my earlier earrings. Just everything, one after the next. Most of these stones, I've had for a long time. The size is very important. Many of my stones were too big to hang under the citrines. The cut is rather key though less important than the size. The labradorite ended up being the best color to go with citrine. Even then, I have labradorite in tiny faceted pears, small rounds, and faceted rondelles, all bought at various bead shows over the years. The pears and rounds...eh. The rough cut of the citrine required a similarly rough cut of labradorite, so I went with the rondelles. I went through most of the rondelles in fact...and ended up with a small rondelle, paired with a tiny gold bead. 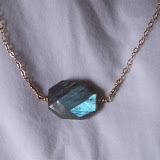 The idea of the gold bead was to "brighten" the area where the (deep grey) labradorite would be. I'd like to do several of these, based on the Dain color-combo theme: two stones of contrasting colors. Since I can't do metalworking to make a traditional bezel setting, I'll go with the Eni Oken weave (which is versatile; it can be done precisely or "messily"). The more I look at this picture, the more I like the frame itself. It's a straightforward enough frame...you can buy readymade ones of the same shape...what I like is the slight roughness, the effect of it being handmade. I've concluded, anyway, I am a bit different from other people. I would rather look at a picture of gears...or ships...or a machine that makes stuff...than look at what people consider classically beautiful subjects, such as sunsets or flowers. That's good for engineering, not so good for design. So, what I'm thinking about the frame...is that I did the frame right. It's exactly the right size and shape, it hangs well, it's light-enough in weight so I can wear these earrings all day (and I have) and not feel them. It's made of argentium sterling so it won't tarnish easily; it's hammered, which gives it a more finished appearance as well as hardening it. I decided not to chase it (yup, I went through a stage where I chased everything) and the hammering is nice and even. In short the frame itself is perfect. The overall design however...on me it looks great, because I'm eccentric anyway. And I'm still in love with the "winter tree filled with robins" concept, and the Madeira citrines are among my favorite stones, ever, they're really terrific. They have the warm red-brown glow of amber, without that soft, easily scratched, easily dulled aspect of amber. And the cut sparkles, as well as glows. There would be room for two chains of a basic size (not the heavy one I used for the citrine earrings of course). It would be a nice way to highlight a smaller stone of some sort. What I've wanted to try is making dreamcatcher earrings like these: Dream Collection. (And may I say I love the Olia site. She did this whole amazing series of pieces and photographs: Olia collections.) I wouldn't necessarily do them with twisted wire, I think I would prefer my simpler wire frames. Oh well, the idea of leaving the chain necklace as is lasted about one day. It's not practical, because the majority of the weight is in front. The weight would have to be counterbalanced by something in the back, whether an actual clasp or a fake clasp, or something. Plus, I'm liking the idea of it as a sort of summer necklace, the kind of thing you could wear with a summer top. In short I'll probably go back to the drawing board with it, but it's too cold now to do much with it. As much as I'm liking all these stone pieces, it's not always easy to coordinate earrings with necklaces. Do you use the same stones? Doesn't it look kinda matchy that way? But different stones can clash. I still haven't worked that out. I've already changed out the silver hoops I used on yesterday's Madeira citrine earrings. The ones I'd made were too big and heavy. I realized I'd made them that way because I'd intended to hang a single citrine in the center of each...then figured the citrines I had were too small for that...and ended up using a seven-stone design instead. The small hoops I made today are so much lighter in weight and easier to wear. It's funny, I knew from the beginning it would start out hard, then become easier and easier to do this sort of thing. Today I had this hoop, I was making the bend for the top and my pliers slipped and nicked the wire. Before I would have been upset, because the nick would weaken the wire at the bend. Today I just grabbed my chasing hammer and hit the nick with it to flatten it. Since this bend would join with the other bend at the top of the hoop, it wouldn't create a weak point. Then, one side of the top of the hoop looked wrong. Before, I wouldn't know how to fix it. Today, I just grabbed pliers, a jump ring mandrel, you can use all sorts of tools and items on wire (the handle of my chasing hammer is one of my favorite mandrels) and bent the wrong part out. Of course my goal is zero waste on heavy gauge wire. I keep it on the coil and work off the end. With the smaller gauges that's not practical, but I do try to use only what's needed...say, with your loops. Unless there's a decorative reason to make a large loop, why not make a smaller one? For my loop-ended head pins, I go for the smallest possible loop, the very end of the pliers. I've also gotten away from the idea of "having" to use specific gauges and tempers of wire for a given project. I used to keep everything separate and organized, now it's kind of all over the place. Unless there's a specific reason to use a particular temper...say, you're finishing the ends of a bulk chain (half hard), or making a wrapped loop bringing the wire down to cover the top of the bead (dead soft)...the two tempers can be pretty much interchanged. If you run out of the one, you can usually substitute the other. Oh, I will have to redo my earlier prasiolite and prehnite necklace. I like the idea, but it's way too "frankened"...it is a Frankenstein of a necklace. I didn't have enough green amethyst to do it properly, then I wanted to use the prehnites, and the chain itself is cobbled together because I didn't have one long piece. I'm thinking of something simpler, anyway. I made some earrings today, but no time to photograph them. So these are two pictures of a whole bunch of robins in a winter tree. The earrings, coincidentally enough, use a bit of the same color scheme. I have some Madeira citrines, and had the idea of pairing them with silver. Actually I was thinking oxidized silver...though it's the current trend to oxidize, I haven't oxidized anything yet. I've used oxidized Bali beads and such, that's it. However I ended up using Argentium sterling in a hoop design, with the citrines wrapped on a short length of sterling chain. I'm still thinking of the oxidized thing but it'll probably be for the necklace. Madeira citrine is even more beautiful in person than in pictures btw. It's a bit similar to amber...brown infused with red and gold. I love amber but it's so expensive to get anything other than chips, which I'm not crazy about, or else readymade amber pendants. And amber is so soft. You can't wash it. Madeira citrine of course is citrine and it's nice and hard. And it didn't look so great. Today I went for four vermeil beads in the back instead of two. Of course now I'll have to shorten the chain. So I went ahead and wrapped all four beads in, without cutting the chain. I'm wearing it now; I won't cut the chain until I've worn it a few days. I don't have any more of this particular chain, so I'd like to be sure before cutting. Oh well, after all this preamble...I'm playing around with the idea of using green stones to accentuate green eyes (I'm a beauty blogger after all). Hence this necklace is not exactly "a green necklace to wear with a green outfit." I tried it out with a green top and it looked underwhelming...the watery greens of the stones paled when paired with outright green. It looks best paired with an utterly neutral outfit where it adds a dash of color. Playing with a new design today. Actually it takes me at least three days now, most of the time, to finish a single design. I'll come up with something, then start wearing it, or start thinking it's too ordinary...how can I make it more special? This will be the first time I've had to counter-weight a necklace, beyond adding a couple of beads in the back and/or a heavier clasp. This design uses a lot of stones...seven green amethysts and six prehnites. I love how it looks but it is heavy in front. I put a small chain and an extra vermeil bead in the back. I wore it a few hours today...there is a noticeable difference from adding the weight in the back. It feels noticeably lighter on. On a side note, the green amethyst is beautiful. I prefer that the color is subtle. I read on the Net that true prasiolite, commonly called green amethyst, is either rare or non-existent (depending on which site you consult). Most of what is sold as prasiolite is heat-treated amethyst. I'll have a picture of it when it's 100% finished. I promised to make a copy of this for a friend. I've gotten some higher-grade aquamarine...so much of what is sold in shops and even at bead shows, is dyed, or otherwise not very good quality. I have a much nicer aquamarine drop for the front, so I might tinker some with the design, but it's basically going to be a y-necklace on long-and-short chain. For earrings...I have some I've never photographed that, though they're not particularly sophisticated, I like. They're just tumbled nuggets of aquamarine, undyed but probably grade C, wrapped at the top in goldfilled wire, stuck on niobium earring wires. The color makes them look pretty. Another project...I have to wait until I can get some oxidized sterling chain. I'm not completely ga-ga for the current oxidized silver trend...it looks nice, it's just not something I'm normally wear myself. But the green amethysts would look great with oxidized silver. Probably better than with gold in fact...I went with gold for the first green amethyst project because it looks fancier. The silver project would be more casual. I have some other things in mind as well, but, as I may have mentioned earlier, my plans for 2008 are to make overall fewer pieces, but better ones. Discovered I'd managed to fluff one of the vermeil beads in the back on the original piece. After I'd fixed it, I decided to go back and make it current, i.e., fix it up the way I'd do the same piece today. I've decided one of the Laws of Beading...besides "the last element you need to do is always the hardest"...is "it's somehow harder to redo an old piece than to make a new one." I had to wrap one of the chalcedony beads literally five times, if you count the original wrap. Twice, there wasn't enough space to tuck the wire, and the second time the spacer bead got crushed up (discovered it was a seamed bead)...the chain slipped out of the wrap once...then, when I'd finally done it, I discovered I'd managed to cut off one of the links of the chain. Meaning I had to redo both the chalcedony bead and its adjacent link. Bugger...but it looks nice now. Better than in the pic. In other news: a Shiana Sakura sighting: Entwined and Dew. She's got more Shiana products up in her Etsy shop. I find it helpful to see the components "in" something, even though the Shiana site photographs all of the pieces next to a ruler. I have one of those Sakura pendants...haven't gotten around to making the necklace yet. It looks nice in the link, on a silver chain. I'm envisioning garnet or rose quartz with mine (it's bright silver too), or...green stones? I just finished watching last season's Dirt, the tv show with Courteney Cox. It's very much a Hollywood insider show...and I like it, it's good. The reason I'm mentioning it here is, they use the most fantastic artisan jewelry in that show. It's like they made a point of finding really nice stuff and then having the various characters wear it. I could watch the whole thing all over again just to look at the jewelry. Highly recommended. Haven't made anything new lately. I suppose I want to step back for a while and figure out what I really want to make. I came across a pair of earrings, neglected to bookmark it, now I can't find it...grumbles... It was a very simple design, two large Tahitian (I think) pearls, on 18KT gold wire, I suppose they had to ream the pearls out some as they were strung directly on the wire. They had a small rosary loop on the bottom, and the top part of the wire formed the earring wire itself. On the bottom, they had gem grade aquamarine briolettes. Fairly sure these were side-drilled. I don't want to make them with aquamarines, I just liked the idea of integrating large pearls with gold wire. I haven't made anything new since whatever I last blogged about making...aha...the square pearl pendant. It's a weirdly good piece btw, for being so simple and imperfect. The pearl I used has a teeny pit on one side, it's on a goldfilled split ring rather than a bail, all in all it shouldn't work, but it looks perfect on. I didn't make the necklace, it's Iranian. The blue stones in it look like lapis to me. It's funny, when you're unable to work on a new piece, that's when you appreciate your "made" pieces, almost as if someone else had made them. Interesting. Good and (ever so slightly) bad news...I'm getting a whole new work room! It's actually my own room, but I haven't been able to use it in eons since it was blocked up with...is there a nice way to put it? Ever live with packrats? Anyhow that's the good news. It's a small room, but, so what? One of the virtues of making jewelry is that it's a compact hobby (unless of course you are fortunate enough to do metalworking). 100% of my materials fit into three of those plastic boxes made by Darice that you get at Michaels, an old cardboard box that once housed a Givenchy Organza perfume set, a paper lunch bag, and a couple of odd items like my block. That's it. * Why vacuum both sides of the rug? It's one of the best ways to prevent moths from making your rug their home. Moths like it quiet, and the bottom side of the rug is quieter than the top. ...do some mopping, finish the Windexing/dusting. I need to go through my computer books too but I might put that off for later; some of them are very old. That's one of the places I feel my age the most. When I was young, I could go all day, cleaning. Just give me a cold beer, a fresh vacuum bag, Windex, Pledge, cheap paper towels...I added Swiffer cloths to this lineup... Now I did only half of it. And I'm trying to motivate myself now to do the other half, so I can start setting up my jewelry stuff there. Trying out a new piece today. Hmmm...I don't know yet. As I was making it, I ran out of heavy gauge wire. It's true what I read on the jewelrymaking.about.com forum, you can make jump rings on the fly out of relatively small pieces of wire. As long as you can wrap it around your round-nosed pliers a few times, you can keep on going. I haven't made anything new today, had to clean the house... I need to test something out though. I've been having problems publishing on blogger.com. Since it does seem possible to publish from an older browser, it would appear to be browser-specific, but I'm thinking it might be a matter of changing some settings. Hence, I need to blog so I can publish and test out my theory. Anyhow I've been wearing my hammered sterling silver wire "tulip" earrings. They're pretty neat, even if they did become more of an engineering challenge than a design challenge. I like 'em. I'm no professional photographer, but taking pictures of jewelry is a skill anyone who makes jewelry needs. Photographing your jewelry is one of the best ways to see how well you're doing. Every little mistake or flaw becomes apparent when you take a close-up picture of the piece. It's also a good way to track your progress, especially if you organize your photos chronologically, as in a blog or online photo album. It's also the best way to keep a record of how you made the piece (surprisingly easy to forget exactly how, even with a relatively simple piece). Finally, it's a skill you're going to need anyway once you start selling jewelry. Even if you don't sell online, you will likely want to have an online "showcase" for your jewelry. Here are a few things I've read about, and what has worked for me. Natural, indirect lighting is the only lighting that's ever worked for me. If you're going to go pro, you'll probably rig up a light box, but I've found adjusting the camera settings can work quite well. My "old" Kodak DC4800 actually has aperture settings, so knocking these up a notch or two keeps too much light from getting into the picture. On my other "old" Olympus Camedia, there don't seem to be aperture settings, but you can change the white balance to daylight. The quintessential "boring" plain white or black background works best. You can always add a prop or two, but somehow colored backgrounds look nice but distract from the jewelry. I have had luck using wooden backgrounds, like a wooden table. Dark grey can work. Red is good but I would use it only for key pieces, not for every piece. Use the "macro" (tulip) button on your camera and play with using optical zoom. I don't have a tripod, so what I do is use my hand. I rest my digicam on my left hand, as if the hand were a tripod. The ideal is to rest the hand itself on something else, but even if you're holding your left hand in air, it's still better than trying to take a close-up by holding the camera in both hands. On second thought, forget about either of those two ideas. I don't want to use fine gauge wire for this design, and I now think the indentations have to be, for all practical purposes, closed, not slightly open. Slightly open simply reduces the likelihood of the crystals jumping into the next indentation. Since the design hinges on the crystals being in the right place, that's not good enough. I'm now thinking the indentations have to remain closed after hammering the wire. Once it's hammered, you can't really manipulate the indentations closed again. All in all this design is a bugger to make. Yet I still like it; it's different. I'm going to try another incarnation of this design today. Ugh! No matter how closed those bottom indentations appear to be, the crystal dangles still manage to end up in the wrong place. I suppose it's a matter of hair moving them up and down. Last night I tried squeezing them even more closed, and I'll try them out today that way. If that still doesn't fly, then I might make a last ditch effort to wrap the tops of the indentations with fine gauge wire. I'll see what it looks like, anyway. I have the tools and materials part basically finished, with photos. What's frustrating is that I can't really finish it until I get some wire. The sad fact is, I've used a limited array of wire. I've hardly used soft wire at all...I bought some to wrap a few briolettes with...but in the main, I've used only half hard. As far as gauges...I've used 20, 22, 24 and 26. For components, 20 gauge would be the thinnest you would normally use. My 22 gauge argentium silver earrings are nice but I wouldn't care to make a lot of them; they're really quite delicate. So, that's where that is. The wire is next on my to-buy list anyway. It's funny now that I think about it, but I actually haven't missed buying beads that much. I thought I would. There are some beads I need to make specific projects...the black crystals for the choker, some black semi-precious beads of some sort...I haven't designed anything with black semi-precious stones before, I'm clueless. Black onyx? Jet? Black obsidian? Blackstone? I would have to see them in person. Then I had the idea of large pearls and small pearls for particular projects. Aside from these though, I've been able to keep busy using beads I already have. Et cetera, et cetera. 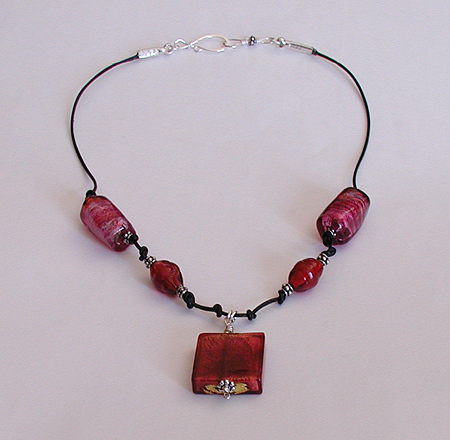 Even when I was starting out making jewelry in 2005, there was already quite a bit of information online about doing so. Now of course there is a great deal more. I think I will try my hand at a simple tutorial though in the next post. Nice eh? This is the icon for our "site tools" section, from the site map for TheBroadroom.Net. Do not despair, I am going to put up all of the site content. I have the content. Most of it is going to end up in the topic blogs; I'm projecting another month to finish it. 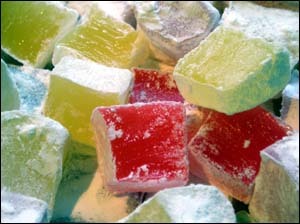 May is drawing to a close...I'm rather thinking that three months is too long for a "bead cold turkey." Actually I don't know yet. I have only a few beads in my mind now...the black crystals for the choker, some large pearls for earrings, and small pearls for the "five pearl necklace." I'll probably get the pearls at an LBS or I could wait for the next bead show. The crystals are cheaper to buy online. It's actually wire that I'm running out of. So I may stick to the bead cold turkey after all, and just go for a wire order. The pair I made today were teardrop-shaped peridot (vertically drilled) rather than crystals. Didn't have enough of the tiny goldfilled beads so substituted slightly larger ones. Had to tweak the pattern a bit because of the different size and shape of the beads. But it's basically the same design. You just stick the earrings in and then work on them, because sometimes you need everything to hang straight. Sorry about posting as TheBroadroom.Net a few times recently. Been working on getting the old site content formatted, starting with what's on the blogs...I usually have two blogger accounts open at the same time. Anyhow, I've narrowed it down to three projects...not that I don't have a bunch of half-finished stuff sitting around :D but it's probably easier to do three projects at a time. *** Coin pearl necklace and bracelet (possibly earrings) from the pattern in the previous post. That's easy, all I need are the three-to-one reducers and enough wire to make the hooks. I could actually make the three-to-one reducers similar to this: image I went through this site and couldn't figure out where the image came from, found it in Google and thought it was neat. But I already have three-to-one reducers picked out, it's a matter of ordering them. *** Choker made of argentium sterling silver wire and black crystals. This is a little more involved, since I'll basically need to order everything for it--wire, crystals, argentium silver beads. *** Series of hoop earrings. These I'm going to make in argentium silver first. At least I hope so. At the end of today, I'll know. Amazingly, so far the argentium silver hoops I've been wearing have not irritated my ears. Okey dokey...came up with a design I like for the coin pearl bracelet. It's monumentally simple...realized that, for this piece, I'd gone overboard with the "dragon's hoard" (thanks to Mary V. for this poetic beading term). I suppose I was overcompensating for those days when I didn't have that many kinds of beads to use, but sometimes, simple is good. In fact I like this design so much, I'm going to make a matching necklace. Maybe matching earrings (it's going to depend how many coin pearls I have, so I might need to modify the design some). Not sure if I like that two-strand pearl bracelet. With the citrines, the two-strand design works...because the citrines catch the light...you get a nice glowing effect even with only the two strands. But for whatever reason, two strands of pearls don't seem "enough" for that piece. I tried adding on another strand, just literally adding it to one of the loops in the two-strand clasp. That aspect of it does work...using a two-strand clasp for a three-strand piece, it doesn't look funny. But I'm looking at redesigning and restringing the entire piece. It does look funny having two of the strands in a two-to-two connector bead and one strand just by itself. Darn. I have some three-to-three connector beads left so that's my plan...take everything out, make a more cohesive design and shlep the three new strands into the three-to-three bead. Right now it's a train wreck, I put some 8mm Swarovski roundelles in the new strand (these are nice) but the overall look is too undefined. Had to make some jewelry on the fly today. I already had my multi-strand freshwater pearl necklace (in the Handmade Jewelry gallery linked to at the bottom of this post). It's a good piece, dramatic without being over the top, but I had only a few pearl earrings to choose from (I know how ridiculous that sounds...and I had to choose which limousine to ride in too, my life is such a tragedy). But given that I have pearls from here and there, I decided to go with a simple pair of coin pearl earrings. (I'll take pics tomorrow, promise.) It was at this point (I wasn't rushing, had a couple of hours to come up with earrings and a bracelet) that it occurred to me that finally, after toiling since the latter half of 2005, I was now at that magical point at which you can make a piece of jewelry without reinventing the wheel. That's been my big, albeit lazy, dream since the beginning. I wanted to develop my own "templates" for pieces. Didn't want to use anyone else's templates...nothing personal, just wanted to develop my own. Just plugged in a coin pearl instead of American turquoise. For the bracelet, I went with an existing design also...I don't have a pic of the original, since I'm still fiddling around with it. But it is a two-strand bracelet, one strand made of coin pearls, the other corn pearls. Went ahead and made the other earring. For one thing, nothing drives me crazier than making a single earring. For another, so far, the argentium silver is working out. It's premature to say, but so far, no redness, swelling, itching or irritation (knock wood)! Regardless of whether the argentium works out, I had been planning on making something like this for a very long time. What I'd like is to make two sets of hoop earrings, one silver, one gold, then make a bunch of little dangles to dangle off them. It's the same as those sets they sell you, but here you get to choose the size of your hoops, the exact material (I could make such a set in 18KT gold), and the beads to use for the dangles. As a beader the notion of being able to use two beads is attractive unto itself, as, so often, you end up with a few "odd man out" beads from various strands and projects. I'm still putting stuff into it, but basically I'm trying to take better photographs of the stuff and consolidate all the pics into one place. So what's up? Wore my triple hoop earrings today. Very pleased. It's always a moment of truth, wearing a new piece all day, wondering if the darn thing is going to flip all over the place or require constant "fiddling," but this is good. I'm definitely going to make a pair of them later on out of better wire. The hoop earrings out of better wire, probably either two smaller nested hoops or a single hoop design. Perhaps a simple endless hoop. I'll have to make a prototype for this first. A hoop with a pearl dangle? This can be the same as the endless hoop, or just a smaller hoop. A five pearl necklace. Here I'm going to need 14KT gold chain or better, because this is going to be a super simple piece, literally just five pearls on gold chain. Still shopping around to find reasonably priced chain. I've ditched the idea of making handmade links...tried it out today. They're not soldered, just wrapped the ends around and hammered the links. Kind of interesting, but not that great. Have the idea of getting two large pearls...these need not be perfect pearls, just large and interesting looking...for a super simple pair of earrings. If I think of more stuff, I'll push it onto the end of the list. 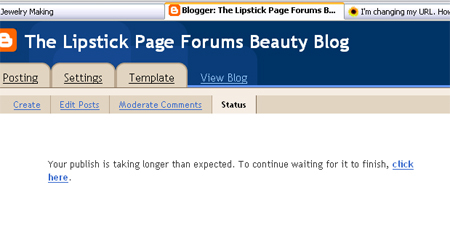 Have you been having problems publishing on Blogger lately? I had this post sitting in the blog but it didn't get published. Anyhow, finally got the chance to take apart my wrapped link necklace mentioned earlier. I put some of the links back together in the basic design for the choker. It looks good. I'll have to skip adding anything on the bottom of the choker, that would just look cluttered. But the basic idea looks good. Gold or silver? Gold would look fancier. Let's make it goldfilled wire. Not sure what to do in back. Technically it should end in three "strands," two longer than the third (easy, add a jump ring or two to the shorter one, or a teeny bead link or something else to extend it). Thinking of using a three-to-one reducer bar and a simple hook. Each time it doesn't publish, I feel like adding on some thoughts. I need to make some silver earrings with black stones. 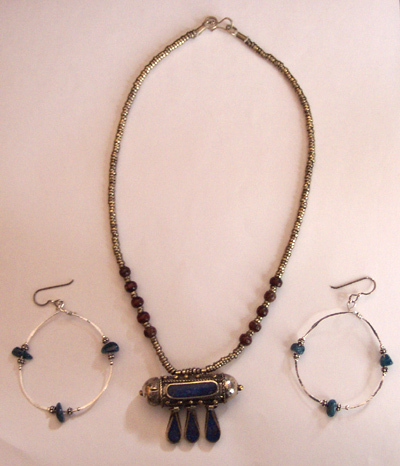 Silver earrings same as the picture, with lapis stones instead of apatite. Haven't been able to make anything new lately...grumbles... What I was planning to do, was take apart the necklace here...it's one of my earlier ventures in making wrapped links, I don't want to keep it. But I was going to use it to develop the pattern for my black sparkly choker. It will also give me a better idea what size crystals to use. It could be designed like a series of flower shapes. In that regard, the flower shapes could be different colors...or the same color, connected using a second color. I'm drawing it out now and each flower shape would consist of 12 wrapped links. The connection consists of only two links so it's the flower color that's going to show. Once I get a few of the existing links connected, I'll know whether or not this design is going to work. If it isn't, I'm game to make an illusion necklace instead. And I was looking around on Youtube for some videos about precious metal clay...because I've spent some time on Youtube, can I admit I love what Google did with it? At first I was convinced Youtube was a bunch of crap, it would simply be everyone who would otherwise have wanted to be on TV...but it's good. Have no idea when I would be able to get into this...I'm just saying. Okay, I have an idea now for the choker, although it is nothing like the one in the previous post's video. I'm thinking of making it entirely out of wrapped bead links and jump rings. Revisiting the earlier idea of making the "fabric" of the necklace out of such. What's going to make it stand or fall then, given that it's going to be a simple design, is using the right crystals and wire. I checked the price for wire with a higher gold content on my supplier's site and, forget about it. This kind of thing is a real wire-eater so it will be either argentium silver or 14KT goldfill. I actually have some argentium silver wire on hand, it's half hard but I've gotten used to working with that. If I want the jump rings to be argentium silver though, I'll have to get some wire for that. I'm envisioning using round crystals. The idea will be to use a crystal with some width, to fill up more space between the links. I'm thinking jet crystals with two finishes, regular and AB. Speculating that AB on its own would be too flashy, and plain on its own would be too ordinary. If I get the beads now, it will go against my "bead cold turkey" since the idea was not to buy new beads until next quarter. The thing is, it's going to take me forever to finish this piece. I'm going to turn it over in my mind some, but right now I'm seeing argentium silver wire and round black crystals, two finishes (or two colors of crystal, black and clear)? I had a few minutes to kill today, so I started sketching a few things I'd like to make. One is going to be an expensive pair of gold wire earrings. It's not going to be a ginormous pair obviously, but I am making some prototypes of hoop earrings out of less $ wire to see what clicks. Thinking of a simple endless loop, hammered. But if that's too plain, I can go for two nested hoops (not three the way I did my goldfilled ones). Another thought is to take a thick wire and hammer it...not sure how easy it is to prototype this. The supplier I'm thinking of has the spendy wire in low gauges, but I'll have to investigate how thick they go for goldfilled or sterling (it doesn't matter which). I'm digging it mind you, but I doubt I have the skill as of yet. But something along the lines of a more dramatic choker, preferably with black crystals or jet or something otherwise black and sparkly. I've come to a conclusion: it's not worth trying to photograph jewelry at night, unless you've got a light box. At some point I will have to construct one...I've seen online the kind that use a plastic gallon milk jug...you cut the bottom off the jug (leaving the top and sides), place your item under the jug, shine light at the sides of the jug, and take the picture through the top (where you used to pour the milk!). It sounds a bit daft but in theory it should work. The issue has to do with light diffusion after all, which is why I can't take non-light-box photos at night (the flash bounces off the shiny beads and findings, creating glare). It's too bad, I made some nice pieces today...one is a six-strand necklace, very simple, just freshwater pearls. I didn't have enough strands of one kind of pearls, so I mixed two slightly different kinds (imo made the piece have a bit more dimension actually). To go with this, I made some earrings out of Bali vermeil reducer beads and wire wrapped top-drilled pearls. They're a tad heavier than other earrings I've made; will have to wear them all day to see if the weight is acceptable to me. I'll have to say it is a singular experience wearing this sort of jewelry...it's out of the realm of much of my prior experience. I hardly ever shop boutiques...love the idea but find boutiques generally beyond my budgets of time and money. Within my spending limits, I've owned a limited range of jewelry over the years. A few really good pieces, certainly, and some things I got at a Tibetan store in Berkeley. It's on College Avenue; a nice shop, one guy running it, a wide range of sterling and semi-precious stones...a couple of pieces from a Japanese gift shop on Solano (Albany)...some stuff from the hippie guy who used to sell at the Fourth of July Fair here (he wasn't there last year, that was disappointing)...that's about it. What to do next? I need to glue my end caps and try them out. I've already made the hook part of the clasp for that piece, waiting before making the "eye" part (since the eye can incorporate a bead from the overall design of the piece, thus making it a customized clasp). I'd like to hammer some earring components...I have made some (few) I like out of wire, would love to see how they look hammered. I'm going to have to buy soft wire for at least some of these ideas. For that matter I'm game to hammer an earring wire and see how that goes. I suppose back in the day I would have been entranced by the cosmetics in this pic, now it's the necklace that catches my eye. :) I'd like to make something with a similar structure...not the same materials in the sense of using bronze or champagne pearls, but rather the idea of three strands of such a length that it covers the upper chest area. Mind you this could as well be a single, long strand, worn looped, but for my version I'd like to do three strands. This would truly appear to be a place to watch tv on your computer...I started to watch an episode of Absolutely Fabulous, but it's past one in the morning here, so I'm going to bed. Taking a little break from jewelry making...I put all my finished pieces on the bed. I have a bad habit of making a piece and not 100% finishing it, or else neglecting to repair/redesign pieces. It's just so fun to start on a new piece. I changed The Broadroom's logo to Flash...hopefully not "Flash because everyone has Flash" Flash. Also, it's a minimal file size. Someday I'll finish transferring all of the old site over...I had to do the moneymaking parts first to keep the site going, but what you see is about 50% of the original site. I'm warming to the idea of doing more handmade components. These look better than readymade ones if you have the skill, because they stand out. I actually slept in this last night...not something I make a habit of, I really just fell asleep with it on (damn taxes!). It seems to have stretched out a tiny bit. Interesting...it's not horribly stretched-out or anything, but I can see that would be a factor in designing on leather cord, especially if you have heavier beads in the design. The chain design in front was still intact when I got up! The necklace had turned to the side some but the butterfly-esque six chains were still nice and flat. Still not sure of the design. It's a bit old style, like the chunky bead chokers people wore in the 70's. That could be a good thing. At any rate, the E-6000'd tiny cord ends worked great. The whole thing is modular...I was struggling to remember that term the other day. It's used in programming among other things...modular programming means you can move the code around, reuse it...rather than a ginormous block of code you can't do much with, beyond whatever it was originally supposed to do. So the idea here is this...if I wanted to swap out any of the components in the piece, I could do it easily. I've been doing that for a while...the one thing I haven't gotten down yet is getting a wrapped-link bracelet to work, other than just wrapping the links together. I'd like to come up with a better-shaped wrap (shorter and fatter) so that the links could be joined with jump rings without looking too sparse. The sterling end caps are on completely tight. Amazing! I doubt I'll have to crimp the ends, just deciding whether they'd be prettier if I did. I'm wearing the one with the heart pendant on it. Hm. The design is good in the "stable" sense...I lay down and took a nap today with it on, half-wondering if something would pop in my sleep, got up...everything looks fine. It's a bit eerie actually, I expected the six chains in front to tangle up somewhat. Now...is the design fantastic or craptastic? That I do not know yet. I don't usually do big chunky beads, or red beads, or even glass as much these days, and I have little experience with leather cord beyond making a simple cord for pendants. It's comfortable though, not too heavy, since it's only just the three beads. The other piece looks okay too, I'll figure that one out tomorrow. Oh and cough cough How about someone making wire guardians for leather cord? Wouldn't that be nice? I'll have to see if there's already something like that...as far as I know, french wire is usually quite small, designed for silk or softflex. I looked at the E-6000'd end caps today some, they seemed pretty tight, even the larger sterling pair. Will wait the full 24 hours before testing them much though. Already I prefer E-6000 to GS Hypo Cement (it's apples and oranges, I'm just saying). It's much easier for me to use. The Hypo Cement is thin and tends to ooze out of the tube even after you've stopped squeezing it...I've read the trick is to not get impatient and squeeze too much in the first place...but the E-6000 is quite thick and hardly oozes at all. I can see Hypo Cement would be better for small applications...even the smallest hole in the plastic applicator tip that came with the E-6000 is large relative to the needle tip of the Hypo Cement. 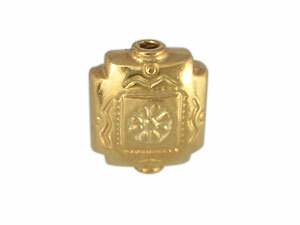 Here is a link I got from the jewelrymaking.about.com forum: The Fairtrade Foundation, London, UK. I haven't explored it yet so can't comment much, but it is intriguing. I'll have to see how many jewelry supply companies belong to Fair Trade associations...Rishashay comes to mind, I will have to do some research. Got about an hour of sleep last night, stayed up to do the taxes and then started doing Net stuff. So I'm not sure I'll be able to do much jewelry-wise today. There's a ton of work I'm supposed to be doing at any rate (not jewelry related). I have some commission pieces coming up, which is a bit more fun than designing for yourself. I think the ideal of jewelry is not dissimilar to cosmetics in that you should enhance the beauty of the wearer...not always easy, it's an art. Wore some of my pieces today...the Bali vermeil cage beads and turquoise necklace and turquoise earrings pictured here. So what? you're thinking, well the funny thing is how "right" these two pieces felt on me. A bit hard to explain. I'm naturally a shy person, I don't wear flamboyant things...but then there has always been a side to me that was never afraid to stand out. The vermeil cage beads, along with the bright blue turquoise, really do stand out...and paired with the earrings (more bits of bright blue), the effect is noticeable. All in all, pretty darn pleased with these pieces. What I need is to use the E6000 to glue the 4 leather ends into tiny goldfilled end caps. Now I could have elected to just knot the two ends together on either side and then finagle the clasp in there somehow...I was playing with it last night. Or I could have done the adjustable leather cord thing, like this: Robert Wan, Tahitian Pearl Necklace. Why the end caps then...it just seems nicer than knotting or doing the adjustable cord thing, for this piece. I have some gold in the design after all. This is sort of craft-related, but it's also a bit creepy. They just opened a Wal-Mart in my area...we're probably one of the last places that never had one, up until now. That's not the creepy part. The creepy part is that every surrounding store that I visited today, was next to empty, on a Saturday. Went to Jo-Ann Fabrics...I'm not generally crafty, don't know how to sew or knit, but I needed to get some E6000 to try out. There was a handful of people there...and that Jo-Ann Fabrics was usually very busy. Went to Target (needing some socks) and that was similarly quiet. Usually I spend my time there maneuvering my shopping cart around all the other carts...not this time. Again, the relative handful of shoppers. The entire strip mall outside where the Wal-Mart was, was almost deserted...Circuit City, Ross Dress for Less, etc. Places usually mobbed on the weekend. Out of morbid curiosity, I decided to drive by that new Wal-Mart. Sure enough, the place was packed; you could see even from the parking lot. I'm not going to launch into an anti Wal-Mart diatribe. It's just true what they say. If a Wal-Mart opens anywhere, everything around it dies. Or at least I hope it doesn't die in this case. I hope this weirdness is only because of the Wal-Mart grand opening. Last night and today I was working on adding more features to this blog and some others on our site (Beauty Blog, Fashion Blog, the Lipstick Page Forums site in general). You can now have updates to this blog emailed to you, from Feedburner.com. A new and much better search feature, Google Custom Search, replaces the blog search that used to be at the top of this page, and the domain search on the left. All it does is search this blog, and it's better and more up-to-date than the old header search. I don't subscribe to feeds myself but there is a link to do that now. I haven't made anything on stretch cord for quite some time. Part of it is the philosophy of experienced jewelry makers (I'm not one, I'm just saying) that stretch cord wears out over time...if you have beads you care about, you should avoid stringing them on stretch cord. That's the philosophy anyway; I haven't been at this long enough to have a piece wear out one way or the other, but it does stand to reason. Stretch cord is more attractive to the absolute beginner, because there are several components involved in making a good non-stretch piece. If you don't have the components yet, it's more straightforward doing the stretchy stuff. Non-stretch pieces are showier since you get to do a clasp...and more versatile, since you can make their length adjustable. You can also do heavier beads and longer lengths. I don't know where that came from...I was just remembering when just about everything I did was on stretch cord. What to make next? I've figured out something at any rate. My strength is not in design or color...it's in engineering. Sounds kind of weird, but you can make it work. Probably also why I haven't been sketching ideas for designs. (Which I should be doing.) I tend to want to start with an engineering challenge...how can I make this piece happen? Mind you, I'm just starting to get enough skills to even begin to think that way. But I am attracted more to designs that involve some aspect of: how did you do that? I envy people who have a strong color sense. My daughter does; I don't. Even when she was only a few years old, she was mixing her own colors with her crayons. And I envy people with a strong design sense, who can make a beautiful pattern out of the pieces. I'm a little better with that, but I'm still behind. Oh, we Americans are becoming good. I say this because we ourselves are behind, relative to, say, Europeans or Asians, in terms of us not having generations of crafting experience to work with. That's okay, we are a new country and you have to start somewhere. Americans are and will always be pioneers. Oops, forgot to mention my EZ Bracelet Sizer came yesterday. It's basically like a piece of laminated paper; you assemble it easily, by pulling a protective strip off the adhesive strip, and pressing the two edges together to make the cone shape. It doesn't stick and unstick...you can get it apart if you stuck it wrong the first time, but it says the glue eventually becomes permanent. It's a bit thinner than I'd somehow thought it would be. It seems sturdy enough though. I put a bracelet on it and seemed to get a measurement of 6-3/4" where I was expecting 7". However, so what. Measuring the strand is not the same as measuring the inner diameter...and the actual measurement itself is not that important. What's important is that you figure out how big you want the inner diameter of your bracelets to be, find that line on the sizer, and use that. Overall--worth $8? I think so, if only because it is not that easy finding an existing object with those dimensions. Most drinking glasses are too wide at the base. You could use some in a pinch...I saw some plastic ones at the Dollar Tree that looked unusually narrow at the base. But the EZ Sizer is still a bit more practical as the narrow part is narrower and longer...easier to dump a multi-strand bracelet on it. Been playing with my last bead order... I'm rather liking this "cold turkey." It's different from how it is when you're just starting out and you don't have anything and you're trying to put together something nice. That's much harder, trying to figure out what you need and always finding yourself short of something crucial. Now I have stuff, I just need to think more and plan more. It crossed my mind that I haven't been drawing...sketching on a piece of paper. That's not good. I always sketched, for programming and doing websites. If you don't find yourself drawing something, keeping a pen and paper in your handbag...that means you're doing most of your thinking when you're actually making the piece. Not good. Heh heh, I got some of those Bali "cage beads" in the order. They are even cooler in person. You can use them either open or closed; they look beautiful either way. I toyed with the idea of combining a cage bead with a bird bead, but figured that would stretch the cage metaphor until it screamed for mercy. Or...? It would depend on the bird bead. It would have to be large enough to show that it's a bird. Anyhow I have a necklace done. It combines both "open" and "closed" cage beads, plus I used up some rather dreadful soldered jump rings I got from Fire Mountain Gems. I shouldn't say dreadful...they're those tiny thin ones you get from FMG until you figure out you can get better soldered rings elsewhere. They never worked for me as jump rings, but they make a beautiful chain. I put these with some turquoise barrel-shaped beads. Wearing it now...so far, so good. Will take a pic later on. I forgot to add, the bracelet pics were taken with the "other" camera, the one I'm less familiar with. I went in and played with some of the settings. I think the thing is this...you have to take fairly high resolution pictures, especially if you're using an old camera. You're going to crop and reduce the size of the picture anyway...I didn't go up to TIFF here, just made the file size bigger. I'm not really sure what I want to make next. I mean I have a few things I need to finish, that are waiting for my last bead order to arrive...what I meant is a more general concept. Looking at trends...a lot of people have gotten into making jewelry...which is good. It's one of those things you have to try, in order to know if you like doing it. Whenever a lot of people start doing anything, the standards of whatever they're doing go up. So, surfing around on Google, you seem to see less and less ordinary work. The people who are staying into making jewelry, are getting better and better at it. Once you've passed the technical hurdles...getting the length right, getting the tension right, getting the materials and suppliers right...you need to produce something better. You can't stay at the same level you were before. The artbeads.com 3mm gold-filled crimp covers...even though they're a pain to use, since they must be manually opened wider in order to fit over 2mm sterling crimp tubes...re-use really well. I tried that today...tried opening some used crimp covers. I had some that had been closed close to each other...the first one couldn't be reused, but the second one looked almost identical to a brand new crimp cover when I reused it on another piece (I would do this on pieces only for myself, of course). The "bad" crimp covers went on my gold fill pile...found out on the jewelrymaking.about.com forum that www.monsterslayer.com accepts gold fill, as well as sterling silver, scrap (either they pay you for it, or else they discount your purchase). Another thought...if you squeeze the artbeads 2mm sterling crimp tubes fairly lightly the first time, you usually can make tiny adjustments...slide the crimp tube up or down a little bit...without damaging the softflex. I did that today, realized I had too much slack on a bracelet (double crimped)...jacked the lower crimp tube down a bit and didn't have to restring (the slight extra gap isn't noticeable once you put the crimp cover on). I hope I don't come across as some kind of self-sacrificing, saintly individual. rotfl My whole concept of doing a "cold turkey" involves not blowing all my money on beads right now...so I'll be able to stay in this game a whole lot longer. And I am trying to be more conscientious about recycling scrap precious metal. I've had a sterling pile for a long time. I can admit I've been lazy about reusing the crimp covers, but realistically it's only one extra step to at least try to reuse them, and if the cover gets too mangled, it goes on the gold fill pile. I added a "cold turkey" label...I'm really warming to the idea of not buying beads or components for a set period of time. My target is next quarter, so that would be April through June. My "ground rules" cover necessities such as beading wire, crimps, that sort of thing. Possibly bails. The idea mainly is to not get material for new projects, but rather to finish up old projects, or old projects that never got started in the first place. I'm also thinking of doing this every year. Pablo Picasso is where it's at. I've gotten to the point where I can do pretty much whatever I want to do...I can construct just about anything. Construction, and materials, are not as much of an issue anymore. Which leaves us to design. It's easy for me to sink into mediocrity. It's much harder to get out of it. I realize that I stop and rethink my entire approach to jewelry making every so often...so I'm going to have a label just for that. That way, later on, I can go back and figure out how often this happens. Let's call it "rethinking." The last time I did "rethinking" was December 8 of last year (I have gone back and attached the new label). Ack I just finished this bracelet and at the last second, saw there was too much slack on the second strand (right after I'd crimped it of course). On bracelets, even a little too much slack shows. Ugh. I will have to restring it. I'm playing around with the idea of making multiple strand pieces where the strands aren't the same. The same concept as wearing several bracelets or necklaces that go together, only here they're actually attached together. Does that make any sense? Okay, I went back and labeled all of this blog's posts that contain pictures. This isn't a complete indexing by any means, the only posts prior to 2007 that have labels are the "pics" ones and these have the sole label "pics." 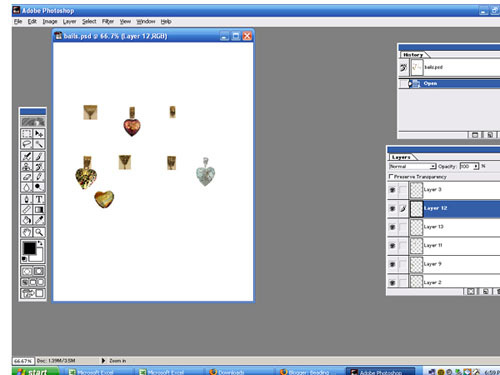 The idea here is that jewelry making is highly visual, for obvious reasons, and going back and adding labels to anything is a big ol' PITA, so I just did the pic-containing posts. I think I got all of them. Going back, however briefly, is always pretty trippy. I don't think I use any of the same materials that I started out with. But I do always try to keep at least one piece from each "phase." That's important, you shouldn't dismantle everything. On a side note, that is also my philosophy with websites. Even if you redo the entire site, you should still keep a little something from the old site (which reminds me just how backlogged I am transferring the old Broad Room site over). Since I hang around on the jewelrymaking.about.com forum a lot (admittedly I lurk more than post, I am in awe of the skill and experience of most of the posters), I can pass along this tidbit of information: some jewelry makers photograph every single piece of jewelry they ever make. On a side note, that is one improvement of today's Internet. Mostly I dislike the "new" Net...it's corporate, sanitized, uninteresting, in the main. But what's good is that the people who decided to stay on the Net now have more permanent digs on the Net. More than four years ago, the people who put together this site registered the domain...and back in those days, only Infinology had enormous webspace/traffic for a low price, and that's what we got. From the beginning I wanted to make this site as permanent as possible. Anyhow, it's a good idea. Even if you take the photographs for yourself only, it's still worth the effort. I made a nice bracelet yesterday, and put the crimp covers on it today, meaning I intend to keep the design. I always wear a new piece all day without crimp covers (if it's a piece with crimps of course :p) because much of the time I flake out and end up redoing the piece. I have successfully re-used crimp covers but it's difficult; much easier just to wear the piece all day crimp-cover-less. It's a bracelet with four loosely twisted strands, made out of those (natural?) pink one-sided button pearls, top drilled, and some definitely not-gem-grade tourmaline rondelles. Earlier I tried making a "flat" design of the pearls but somehow the duller, flat sides always ended up flipping on top. With the twisted strands, at least as many domed sides show as flat ones. The tourmaline...none of it is transparent. Some pieces are translucent while others are utterly opaque, but the "rough" appearance makes it look nice. These tourmalines range in color from your classic watermelon pink, to greenish, greyish, blackish and plum colors. I also put crimp covers on a two-strand citrine and silver bracelet that I haven't photographed yet either. It's a pretty simple minimal piece, but I like citrine paired with lots of silver. Also made a new bracelet today to match the peridot and vermeil necklace in the previous post. Here again it occurred to me how long it takes me to make anything. This is the same peridot I bought at the Gem Faire last October (blogged here), with a clasp I got a few months ago, spacer bars I got from a bead shop (I do most of my shopping online now, with the occasional bead show when possible), Bali beads direct from Bali...easily six months per piece. Ugh, the 3-to-1 design didn't work. The 3-to-1 beads kept flipping (usually just one)...at first I thought it was the twisted side strands, but even after I untwisted them, it still kept on flipping. I realized my black crystal design had a center bead and that probably kept the center stable. I might be able to use the same design by moving the 3-to-1 beads back and making the three center strands longer, i.e. heavier. Since twisting is out of the question, I may make the side strands single rather than double. I went back and put labels on all of my posts as of January 1 this year. grumbles... From what I've read, the only people on Blogger.com who can use features like "labels list" or "label cloud" are people who DON'T FTP their freakin' blog! I tried going into the template and pasting some of the "widget" code there, but it won't work for me. I'm going to have to wait until they extend the features to the FTP users. In the meantime, you can pull up all posts by label, but you have to click on a label on an individual post to do so. Hermmm...I finally figured out what my three strand jade bracelet (pictured here) has been asking for. It's the spacer bars. The ones I used were among the first spacer bars I ever bought, and they're all wrong for this piece. I'm going to get some Bali ones sometime. I'm really pleased with my new bracelet. Okay I'm still waiting on my crimps order, but I read on the jewelrymaking.about.com forum that you can use seamless sterling beads as crimps. I have some of these on hand (2mm, from Artbeads.com) so I tried it out. Perfect--way better than base metal crimps, about on a par with actual sterling crimp tubes. The one caveat is that two strands of 0.014" Soft Flex just fit...if you were using thicker Soft Flex, it probably wouldn't work. The reason I need to restring it is that it's a three-strand design, and I put all three strands (with their respective wire guardians) in the loop of the diamond-shaped part of the toggle. The three wire guardians do fit, but they don't lie as nicely as they would if you put them inside a soldered jump ring and then used a small jump ring to attach that to the clasp. The three strands though, look smashing with this type of clasp. With the clasp on the bottom, the effect is like three individual bracelets. Also, with three strands, the clasp lies nice and flat. The three strands are different combinations of Swarovski crystals, vermeil Bali beads and some clear aquamarine nuggets. I used three finishes of clear crystal: plain, AB and Moonlight. It's mostly bicones; one of the strands has Swarovski rondelles on it. As I say the idea is to make it look like 3 bracelets. What else did I learn...you can't twist the strands on this design, they don't stay twisted, at least not easily. About Moonlight, if you haven't tried it...it's nice. I got some from Fire Mountain Gems to try out...the effect is subtle, not "flashy" like the AB finish. It just seems to have a bit more depth and definition than plain crystal. Worth the extra cost? that might depend on how many crystals you're planning on using. If it's a boatload of crystals, I wouldn't pay the difference. But here it looks nice (I will put up a picture once I've restrung it)...three kinds of clear crystal. I haven't made anything new recently. For one thing, I maxed out all my crimps...now I'm waiting for some. I got a lot this time. Those flat oval beads look so nice, but they are hard to work with for necklaces. They tend to "flip" when you're wearing the piece. I tried getting around that by making it choker length...they flip a lot less that way, but I still don't like the effect. Plus, I think the pattern is too simple. I'll probably mix some of my turquoise nuggets (the same ones in the necklace on the right) in with the oval beads somehow. The fool I am, I already used my vermeil 2-to-1 beads (which I was planning to use for redoing the necklace on the right!). I still have a set of 3-to-1 beads, so I could do that, although I think it might end up too bulky. I'm also thinking of making a super simple strand of the nuggets...oh, I love turquoise. 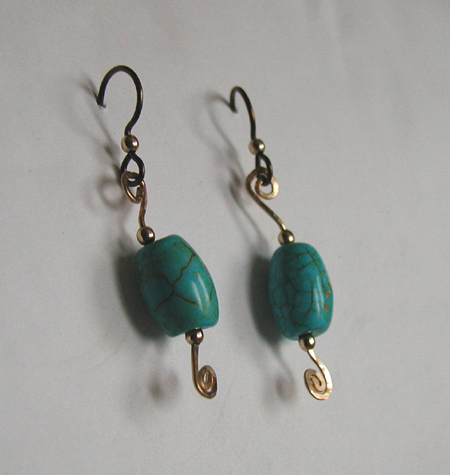 I love, love, love turquoise; it's one of my favorite stones. So...I'm already thinking in terms of three turquoise necklaces, possibly as many turquoise bracelets...I got a lot of turquoise. Just love it. Another thought...for later...would be a jade necklace. I already dismantled my earlier jade and pearl one. Now that I have more vermeil spacer beads to choose from, I think I can make a better one of a similar design, but later on, I'd like an almost plain jade necklace, just a simple strand with a few spacer beads or something. I know I sound like a complete flake right about now, but keep in mind that in this phase, I'm still making most of the pieces for myself. So the process is more similar to shopping for jewelry...I'm thinking...what do I want? What holes do I have in my wardrobe? What necklace is this outfit crying out for? etc. Again with the makeup...but with makeup (reference: I've been a member of makeup boards since 1998, and run one now, The Lipstick Page Forums, which I'm really proud of btw), I never liked "collecting." I'm not knocking it, but I never liked owning makeup that looks great and ends up sitting in the drawer. I have to wear it. I feel the same way about jewelry. Blogged some on our Fashion Blog.